This time has come for spring sports registration. If you haven’t done so already, the deadline to register and pay is February 22nd. If you signed up for Spring sports earlier this school year, but did not pay the sports fee, please send in payment with your son or daughter by the deadline. Track is for girl and boy athletes in grades 4th-12th. The track fee is $100. Practice days vary for the different age groups but are all after school. Track meet days vary as well and most last the entirety of the day. Elementary Track athletes (grades 4-6) will receive a track t-shirt and will wear their black PE shorts. Jr. High and High School Track athletes will receive a complete uniform. All track athletes will need to make sure to bring sweat pants and jackets as a part of their track equipment no matter the temperature outside. Baseball is for boy athletes in grades 8th-12th. The baseball fee is $100. Practice days and times are still be worked out – but you should plan on afterschool 5 days a week unless there is a game. Baseball athletes will need to purchase white game pants and all practice clothing. Games begin March 5thwith a home opener at 4pm vs. Azle Christian School. 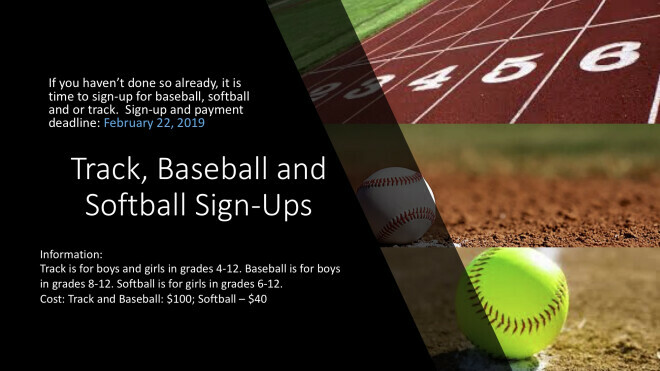 Softball is for girl athletes in grades 6th-12th. We are trying to rebuild our softball program and we play in a few independent games. The fee will cover the cost of game, and jerseys. Softball players will need to purchase black game pants and all practice gear. Practice times are still being worked through but you should plan on it being 2 times per week.